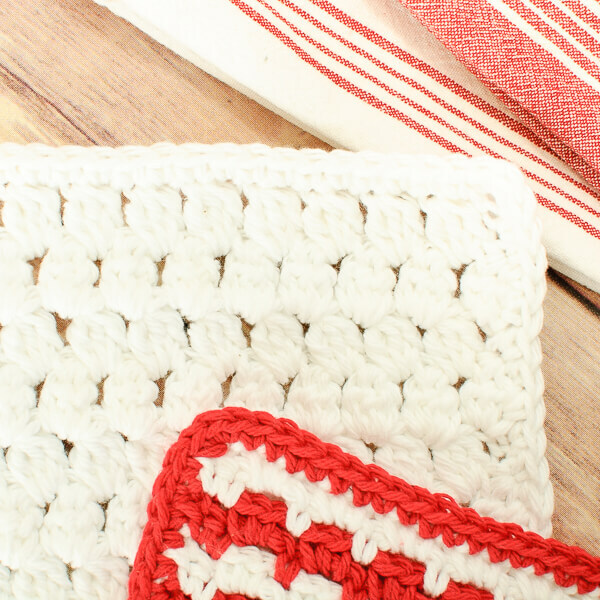 This cluster stitch dishcloth is the latest in my red and white kitchen theme … at least for now. I hope you give it a try. 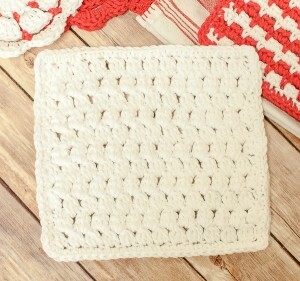 It’s a great way to learn a (perhaps) new stitch too! Three double crochet cluster (3dc-cl): Yarn over, insert hook into specified stitch, yarn over and pull up loop, yarn over and pull through 2 loops on hook, repeat 2 more times (4 loops will be on hook), yarn over and pull through all 4 loops on hook. Row 1: Work a 3dc-cl in 4th ch from hook, *ch 1, skip next ch, 3dc-cl in next ch, repeat from * across, turn — 11 3dc-cl and 10 ch-sps. Row 2: Ch 3 (does not count as stitch), skip 1st st, work a 3dc-cl in first ch-1 sp, *ch 1, skip next st, 3dc-cl in next ch-1 sp, repeat from * across working last 3dc-cl in top of turning ch, turn — 11 3dc-cl and 10 ch-sps. Rows 3 through 11: Repeat Row 2. Edging: Ch 1, work 1 sc in each st and ch-sp across row, work 3 sc in corner, work 2 sc along the edge of each row, 3 sc in corner, work 1 sc in each foundation chain, 3 sc in corner, work 2 sc along the edge of each row, join. 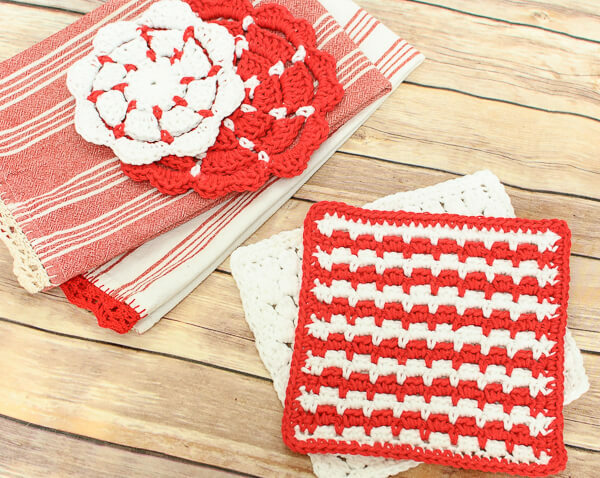 Click here for more free kitchen crochet patterns. I love your great patterns, clear instructions, and especially the Charts! I learned to crochet over in the Philippines with the Diagrams and Charts. They are actually easier for me to read. Thank you so much for a great site. Thank you for the Bible verses too! Definately going to make this pattern. I have a pretty color cotton yarn called “faded denim”. Oh so beautiful… love it! !